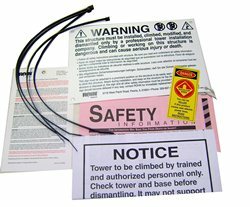 The same Anti Climb Warning Assembly Kit from the ROHN Factory for placement on new tower installations and replacement on existing tower sites where the sign and sticker have faded due to exposure. This ROHN Sign Kit is for placement on new towers or to replace worn signs on existing towers. Kit consists of safety information, high-quality anti-climb warning sign with wire, wire ties, and hazard sticker.